When freezing individually, what do you do with the sauce…? 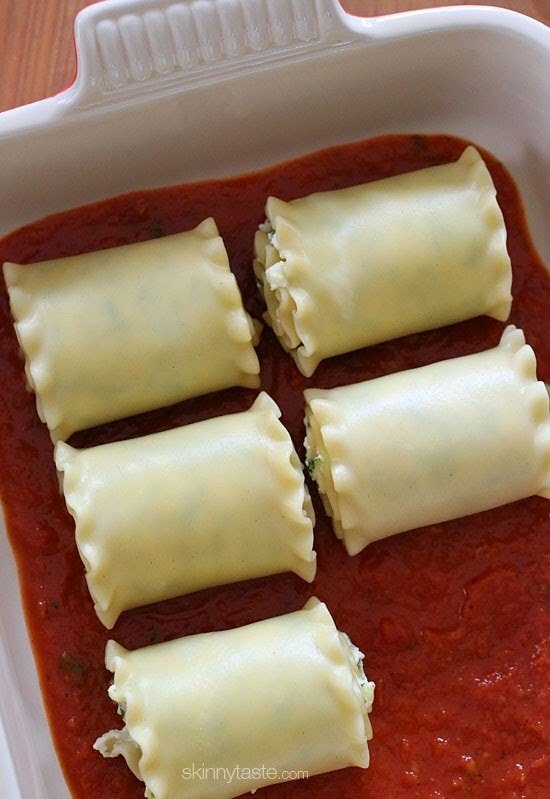 Or if you just freeze the rolls and add the sauce after, how do you do this for portions for 1-2 rolls? You can pour some sauce on the bottom of each container. I made this tonight and it was so yummy! But when I was putting the smart points in my app it calculated it as 9sp not 7. I used all your nutrition facts so I’m not sure why the difference. Do you? I made this tonight and my 7 year old loved it and he normally hates vegetables. This recipe is super easy and an excellent way to help your child eat vegetables without thinking about it. Gracias por las recetas, me gustaría la posibilidad verlas en Español.. I have frozen grated zucchini I’m looking to use up, but not 100% sure the amount of 2 zucchini yields. I have about 4 C. drained. ABSOLUTELY DELICIOUS!!! I added chopped up spinach with the graded zucchini. My fiancé gave it a 10! Your recipes are a hit in our house! Hi! I love this recipe! If I make it in the morning should I refrigerate it uncooked and cook it prior to serving? Or cook it in the morning and reheat it for dinner? I don’t plan on freezing it, I’d just like to make it in advance to serve on the same day. Thanks for your help! These were so good that my husband didn’t complain about them being meatless! He’s a big meat eater, so we’ll done!! Made this last night for my family and it was so good that my son had to have it for breakfast! I don’t usually make lasagne because it’s so heavy but this was really light and summery. Even my painfully picky eldest ate! Yum. I made these yesterday, just as recipe was. They were really flavorful. Easy to make. Will make again! 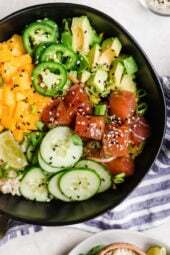 I made these for dinner over the weekend – they were easy, delicious and inexpensive (plus I have a couple of servings left over for quick lunches this week). Will definitely be adding this to my rotation! Twist the zucchini not on the blade, maybe? I’ve never tried it, but I imagine you’re get wide noodles from doing so. Made this today….I used whole wheat lasagna noodles light cheeses and threw in 3 small japanese eggplants (just because I needed to use them up) Very very yummy! Great recipe Gina!! 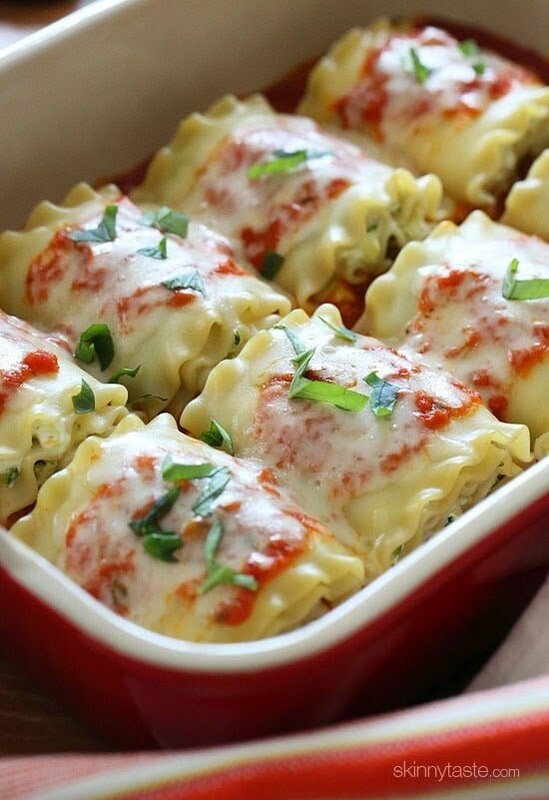 Alternative to those who have trouble with lasagna noodles……stuff pre-cooked jumbo shells. Have you ever made it with part zucchini and part yellow squas? I have more squash than zucchini! FYI – I went ahead and used a mixture of squash and zucchini and it worked great. I always make several batches at once and freeze them so I was able to make extra using both vegetables. It’s a great recipe! Amazingly good! Only one problem, I want to eat the whole pan! Thanks for such a delicious dish. You’ve done it again Gina! Another great recipe! Made these last night and they were delicious. Have loved all your recipes…can never go wrong!! Thank you. Made this today and it was so easy. I love recipes tht are not laborous but the end result in taste and presentation suggest otherwise. Thank you. I did mine stove top with ground turkey and mixed the egg with the turkey instead, whole milk ricotta, spinach instead of zucchini. Came out so wonderfully delicious with my homemade marinara. I love surprising my family with great food. just made these and when all was said and done, only had enough filling for 6. I did think my filling was kind of liquidy as I used cottage cheese in place of ricotta. The zuccini was fine. Could this be the reason? I always drain the cottage cheese and then squeeze it in a cloth, just like the zucchini. It is much firmer and drier that way. I followed the recipe exactly and was only able to use a 1/4 c per roll. This amount worked out perfect, but if I used the 1/3 cup recommended I would have not been able to make 9. Can you include nutritional values with your recipes? I love your recipes and good health is so important, but it's hard to know the nutritional values when they're not listed. How would it effect the points plus if you used leftover skinnytaste bolognase sauce? My family is not a fan of Zucchini, but they love spinach. Could your replace the zucchini with spinach, and would it still freeze the same. Can you freeze theses? I imagine, you would freeze it after assembly but before baked. Then pull it out when ready to make again, don't defrost, just throw in the oven a little hotter or a little longer? Think that would work? These are really good! Thank you! I added cooked ground beef to half of them for my husband, and kept the rest vegetarian for me. Everyone was happy! These are Amazing. They freeze wonderfully. My family can't get enough of them. Thanks for an awesome recipe. Oh! Do you freeze after baked? How do you cook it after it's been frozen or do you bake, cool, freeze? or assemble freeze cook? Does anyone know how much the grated zucchini yields in cups or oz? I have a large Zucchini and am not sure how much to grate. This is my third time making these, and they are a keeper for our family. My daughter asked for them for her 36th birthday tomorrow, so I made a double recipe this morning and will bake them tomorrow. I recommend adding more zucchini to the recipe, as the base recipe barely makes enough filling for my liking. Since it's usually just me and my wife, I put the leftovers, two to a pack, into the freezer for future meals. With a salad and fresh homemade bread, one roll is sufficient for a meal. These are quite filling. Thanks for a great recipe, and I share it frequently on Facebook as I post pictures of food very often. Can these be made two days ahead of when you plan to serve them and kept in fridge, if preparing a large quantity? Or would you freeze them? I made these and they were absolutely delicious! While a smidge messy to make, all of the combined flavored were really terrific! 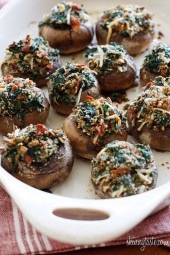 I added about 1/4cup sautéed Cremini mushrooms to this for an additional touch of yummy flavor. So glad I experimented! Will definitely make these again. By the way, I used cheesecloth to squeeze and drain the liquid from the zucchini and it worked perfectly! DELICIOUS! Thank you for sharing your recipes with the rest of us. This and the shrimp avocado salad were amazing to say the least. I will be coming here for many more recipes! Can you use no boil noodles!? If so, how!? I made this last night and it was a huge success! I also used cottage instead of ricotta which worked beautifully. My partner said it was the best thing i'd ever made. Will definitley be a once a week thing! 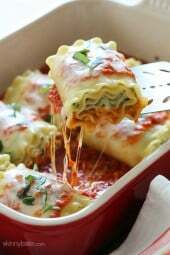 How do I keep my lasagna from getting sticky/starchy between the time of removing it from the pot, making sure it's dry, then putting the filling on the noodle? i always just add a tad bit of olive oil to the noodles while they are cooking. How do you freeze these after baking them? I looked at your link and it says to do it before you bake. I did see a sentence that said if you can't eat it all, but there was no directions. If I freeze them in baggies how would I cook them from the freezer? 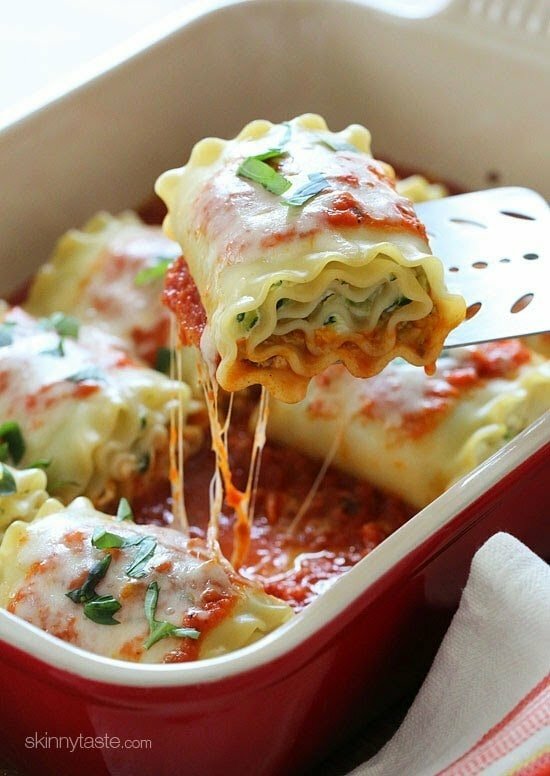 This looks good but I just can't imagine one lasagna roll as a serving. That doesn't seem like it would be very satisfying. Anyone who's made it care to weigh in on that? It was actually pretty filling. My teenage boys ate 2(or 3), but 1 was definitely enough for me. I had one with a salad and was filled up. My husband and daughter each ate 2 and were full. They just had those. 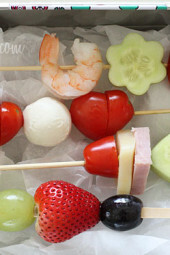 They are delicious and my kids LOVED them (6 & 11). I am a terrible cook and made this last night… not only did I NOT mess it up, it was fantastic! Great instructions, thank you! I'm making these now. I love this site! Any time I'm in the mood to try something new, this is where I look. My husband and I loved these! Tasty and pretty as well. Since I have an abundance of chard, I am going to try making them with that as well. So glad I found your website. Will be adding skinnytaste to my favorites! Could I use this as a filling for Manicotti? I made a double recipe of this a couple weeks ago- ate one batch for dinner and froze the other batch and ate them the next week. Loved it! But I had a question. I'd like to freeze them in individual servings, but how would I cook them? I don't want to turn on my oven to just to bake one or two lasagna rolls. Do you have a toaster oven? Mine worked out well in an oven-proof container. Gina, do you ever freeze your zucchini, either grated or diced? If so how would you squeeze the water from the defrosted zucchini & would you have to freeze larger amounts to compensate for the lost liquid. I have had my zucchini volume reduce by half after de-watering. This was absolutely wonderful! I have never used zucchini in a main dish before but I will definitely do it again… I added in some sliced / sauteed portobello mushrooms to the rolls and am thrilled to have wonderful leftovers for the week! Gina – I just want to thank you for this recipe. My 5 year old son will NEVER eat a green vegetable, and he LOVED these. He ate two 🙂 Thank you, thank you, thank you. I made these tonight for dinner. They were so good. I going to freeze the rest to have next week. Could I make these ahead of time and just seal them in a vacuum sealed bag and put them in the freezer? I've been told that pasta noodles can lat a month in the freezer so I was wondering about these. Any thoughts? I have some extra lasagna sheets and ran out of zucchini mix. These were delicious and a hit with my husband who hates zucchini and will never eat it raw. So I hide it and he thinks things with it are great! I added a tiny bit if sausage (about 1/2 C) that I had left over. Can't wait to freeze them and take them for lunch at school. Thank you for a great recipie, they looked "professional" and were even better than they looked. A hit! These were delicious!! I followed the recipe as is. I've been using your recipes for the past year to cook for my family. I am never disappointed. I love that the recipes are easy to follow and always taste great. Thanks a lot. Can not wait for your cookbook! I made this Monday night, along with your recommended side dish as well! Turned out amazing! I pretty much followed everything down the list, though I don't think I cut julienned my vegetables small enough. The only thing I found a little off was the 1/3 cup measurement for the filling, I think maybe 1/4 cup would be more accurate. About half way through I noticed that using the 1/3 cup measurement would leave me a bit short in terms of filling so I ended up with a few rolls that were less stuffed than the others. But other than that the recipe was perfect! Made this with some garden zucchini and everyone in my family loved it. Even my super picky 9 year old son. He doesn't like veggies much at all, and he ate this and went back for more. Making it again tonight. Thanks for sharing. I have been craving my zucchinis…. I soaked my noodles in hot boiling water for 10 minutes and they came out just fine. Thanks again! Made these last night – they were delicious! Even got the stamp of approval from my husband! My husband is allergic to eggs. Do you think I could leave it out? I'm trying this recipe for the first time today , though mine is a little bit different. I substituted whole wheat pasta noodles,doubled the recipe and instead of using Mariana sauce I'm just using plain old prego. I hope it turns out well! Gina, this was a two thumbs up at my house. My daughter actually preferred the zucchini to spinach. Love the freezer option as well. Thank you! Just made! So easy!!! Thanks! Hmmm…I think I messed up…I only had enough filling for 6 lasagna rolls, using 1/3 cup each. Any idea what I might have done wrong? I am wondering if you may have needed more zucchini. I had so much of the grated cooked zucchini that I was tempted not to add all of it to the ricotta mixture…thankfully I did since I ended up with just enough filling for the eight rolls. Hope this helps. These are easy to make and amazingly delicious (as are all of your recipes). Thank you for sharing! Question, could I make and assemble this a day ahead and keep in the fridge until I'm ready to cook? Yes you can. Just preheat your oven to 350 and cover with aluminum foil for about 25 minutes. Gina, I made this the other night and it was A+++. I added a little more sauce but it was perfect. So light and yummy. Thanks for A MOST DELICIOUS recipe. Delicious!! As I prepared them, I promised my parents I'd drop off a few rolls tomorrow…now I don't want to give away the leftovers!! I'll definitely make a double batch next time. These were awesome! My husband who hates ricotta and zucchini even told me he enjoyed them! I used whole wheat noodles and fat free cheese because they are free on simple start. Thanks! These were delicious. Thank you! I made these for my family and everyone loved them. A couple people were skeptical of the zucchini (I love zucchini, but they don't), and after trying it liked it. Definitely going to make this again. These were really good, i made them last night. Next time i'll take the advice to do some of the steps the night before, especially the grating and drying of the zucchini. I added browned ground turkey to half the rolls for my husband and it turned out perfect! I made these tonight and they were fantastic! Thanks for the recipe!! We used a bit more sauce just because we like a lot of sauce, and it took me a little more time than I thought to prep (but I'm slow..ha! ), but it was so worth it. Thanks again!! This recipe is another winner! My children don't care for vegetables all that much, especially zucchini. I love that I was able to sneak it in their meal. They ate it right up and even asked for seconds! My family and I LOVED this recipe and can't wait to try more of your recipes! I made these last night, and they were SO delish!!! Even my picky husband cleared his plate. Thank you for the wonderful and easy dinner idea! I'll be enjoying the left overs tonight 🙂 I used the food processor to grate the zucchini and it worked just perfect. Next time I'll also use the precooked lasagna noodles to cut out an extra step. I'm making the taco zucchini boats tomorrow! I made these tonight and they were wonderful. I doubled the recipe, so the family and I can enjoy them for a few more meals. Thank you! I made these for dins tonite! I used brown rice noodles which were good. I def didn't squeeze the zucchinis enough which made the filling watery but it still tasted good! 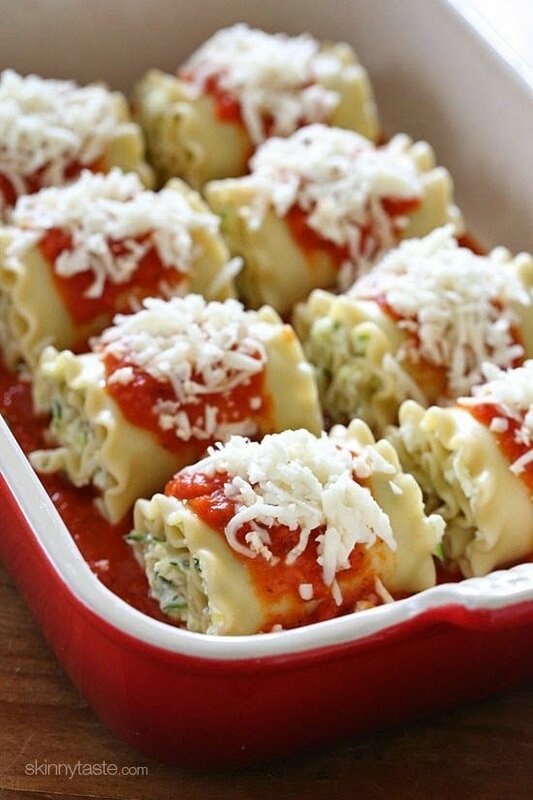 I also used mozzarella flavored almond cheese instead to cut down on the cheese…. Great recipe!! Thanks Gina! I just put this recipe in the oven. Everything turned out really well. One of the hardest thing to do was roll the pasta with the filling. Everything was slipping and sliding and squeezing out. Maybe I need a little more practice since I'm only 24, but I hope it tastes amazing. 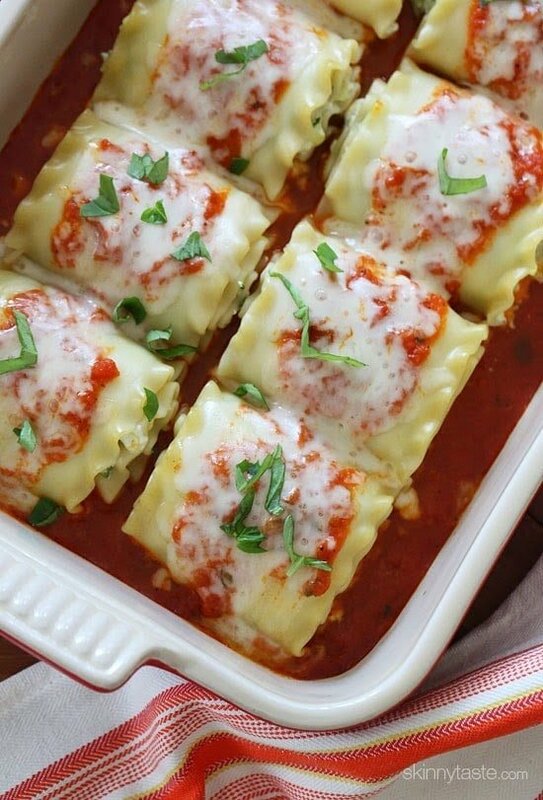 The key here is having your lasagna noodles dry – I laid mine on a clean towel and dabbed the top with paper towels until they were sticky to touch. Rolled up easily and the filling even stayed in! Just made these for dinner. I used low carb pasta and used mozorella in the zuchini mix with the ricotta also added a 1/2lb ground turkeu for my meqt eater hubby. They turned out amazing. 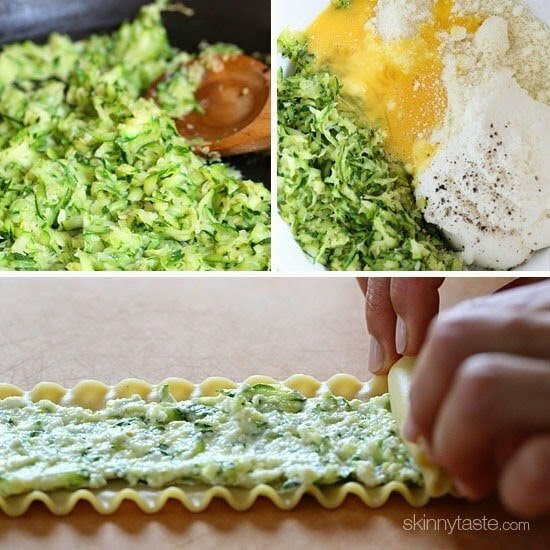 I'm making this tonight and have a question about the squeezed dry grated zucchini. I've gone thru about 10 paper towels but there still seems to be more water. Should I continue to keep trying to squeeze out all of the water? I squeezed it really well, but it will also dry a bit when you saute it. Just put in a fine metal mesh sieve over a bowl and squeeze with your hand. Works great and a lot less paper towel waste. For a vegan alternative, I replace the ricotta with organic, firm tofu. Drain well and mash with potato masher. Add grated lemon zest, nutmeg, and a pinch of organic sugar to taste. To replace the parm. cheese, add nutritional yeast flakes. I am 100% Italian, but for health reasons, have made these changes. The alternative is quite yummy! Thanks for sharing your vegan version! Is there a way to make this that the carbs are lower as my 4 year old granddaughter is a diabetic and also has celiac. Can she have gluten-free lasagna noodles? They sell brown rice noodles, I don't know the carbs, so you would have to look on the box. my family doesn't like ricotta or cottage cheese, what can I use instead of either one of those cheeses? I'm seeing bechamel sauce + parmigiano as the favored substitute, since apparently using the ricotta is an American thing and everywhere else uses bechamel. I found my dinner recipe for tonight!!! I don't have a box grater though….could I just put in a food processor? Made these tonight with fresh zucchini from garden and it was delicious! Even a picky 5 year old and 9 year old ate with no complaints! I made this tonight with fresh zucchini from the farmer's market I picked up this morning and it was delicious! I added some chili flakes to the marinara because I love the kick. I made the full recipe even though I live alone and I'm actually looking forward to eating this all week! Are you still happy with your Paderno spiralizer? I've been researching them and have decided on that brand. I LOVE mine….. 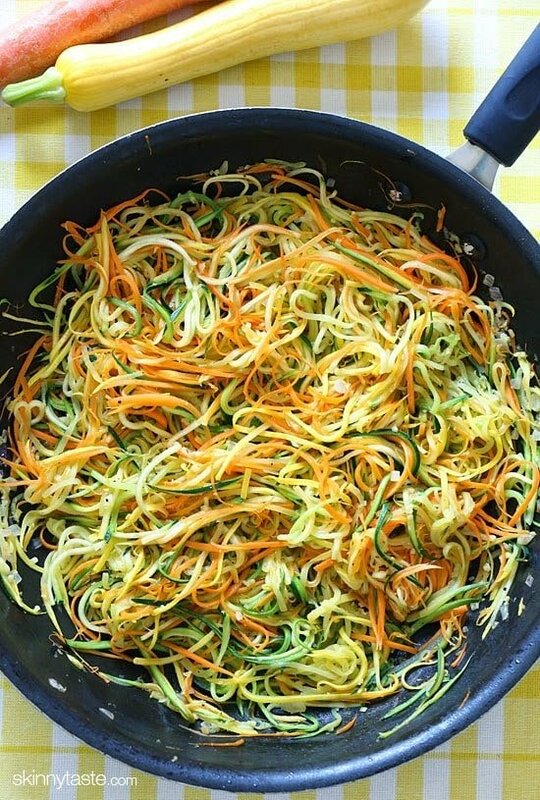 I use it 2 or 3 times a week to make noodles, and the spiralized salad with english cucumbers….. it's the best one out there that I know of… the cheaper versions do not do all the cuts and break down pretty quickly….. So you ARE happy with your Paderno? I've read a lot of bad reviews, so wanted to make sure before buying one. Lots to chose from out there! How do you feel about cottage cheese instead of ricotta? I know it's a lot cheaper but I'm not sure it would work in this particular recipe. I've heard people using it in it's place. I personally prefer the ricotta. You can use cottage cheese instead of Ricotta. I used lactaid cottage cheese- my daughter is lactose intolerant. They came out fine, and she loved them! Will be having this tomorrow. Can you make ahead and freeze for later. Would you make it all the way up just before baking then freeezing? Yes, I included a link above that explains how to do it, but yes, do it in foil or something freezer safe. Cani leave the egg out? My husband is allergic. Just use some egg replacer, can find it at any supermarket and it works well in baking recipes.